More than being a reflection of pre-war elegance, Lisa and Anton Periquet’s house is full of tiny surprises, a play on the idea of anticipation. If there is anything that cannot be said about the Periquet home, it is that it was rushed. When asked how long the house took to complete, she hesitates to answer. “It took a while”, she says, smiling but with a hint of embarrassment. 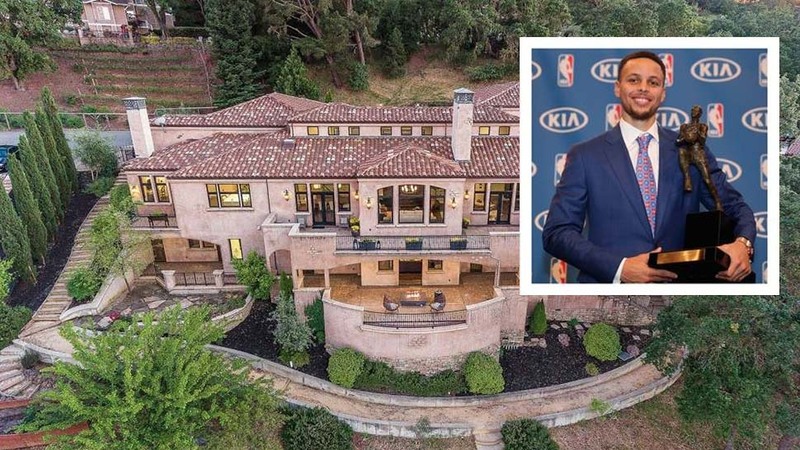 Indeed, a house like this could not have come to be overnight. 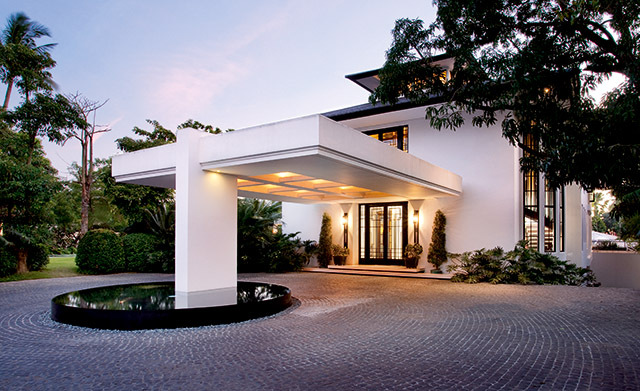 Locsin's signature block cantilevering over the driveway. 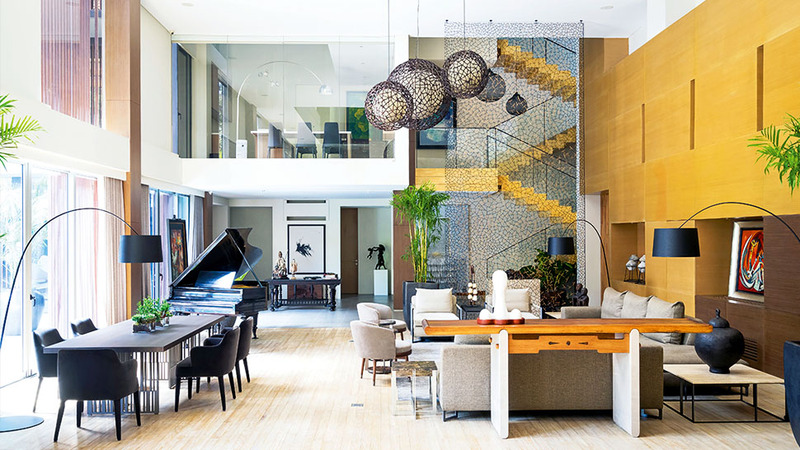 Before moving here, Lisa and Anton and their children had lived in apartments—first in a late-Georgian flat in Kensington, London, and then at a duplex penthouse high above Salcedo Village in Makati. But after ten years in the condominium, the family decided it was time to build a house of their own. 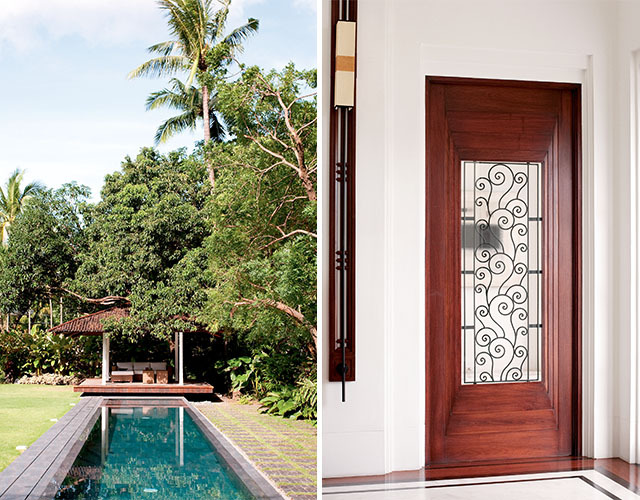 The Periquets were clear about what they wanted—a home that would resonate the Filipino tradition of tropical colonial architecture that has somehow been forgotten. They had two fonts of inspiration. First, the Art Deco houses designed by Filipino architect Andres Luna de San Pedro, the famed painter’s son whose many buildings still stand today. 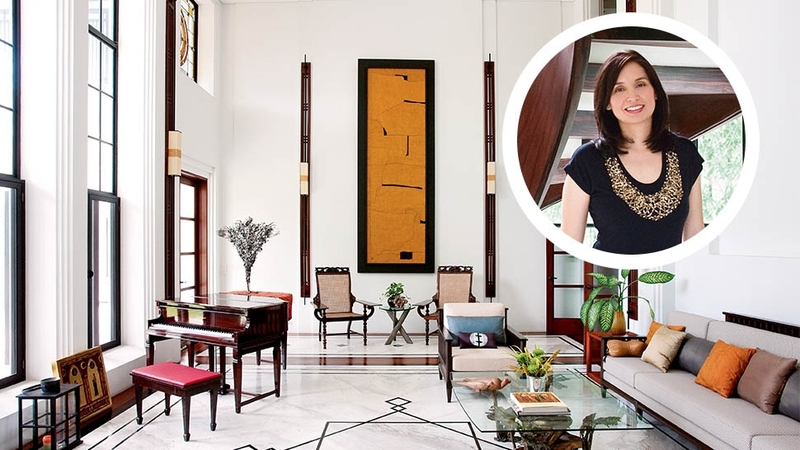 Lisa particularly liked the ancestral home that Luna designed for Natalio Enriquez in Sariaya, Quezon. Second, the black-and-white homes in Singapore. Made from brick, stone, and wood, these century-old detached houses were occupied by European families in the colonial outpost. Floor-to-ceiling windows let in copious amounts of light in the living room. 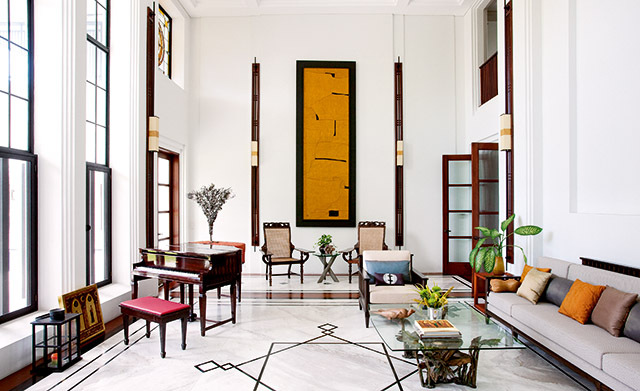 Carefully selected pieces of art and furniture lend a relaxed elegance to the space—an Arturo Luz from the 1980s, Solomon Saprid’s Amihan coffee table, a kinetic sculpture by Gabriel Barredo on the grand piano, a small work by Anton del Castillo and furniture by Osmundo Esguerra, Budji Layug and Tina Periquet. The couple brought in Leandro Locsin Partners to realize their vision. What the architects produced was an airy two story structure that evokes the elegance of prewar architecture. Set in a T-bar layout, the home’s rooms were designed to lie along a single axis, a long corridor which runs along the northern side of the house. It is through this passageway that you enter the main rooms in the house—the living area, the music room, the dining area and the kitchen. The house consistently comes up with pleasant surprises. Right at its front, you are confronted by Locsin’s signature block cantilevering over the driveway. Through the steel-and-glass main doors, you enter a foyer lined with artworks by F.B. Concepcion, Lao Lianben and Fernando Zobel, wood sculptures and a long gallinera. Lisa at the landing of her piano-key spiral staircase. Natorious embellished top, natori.com. Gaupo Shoe Couture, Greenbelt 5, 729.8672. On the floor is an Art Deco onyx clock detail set on limestone. On the northern side is the circular staircase that looks like a suspended spiral of piano keys. Before it is the entrance to the corridor, which serves as the house’s main artery and spine. The living room is church-like in its airiness. Filling it are pieces of furniture from the Periquets’ old Salcedo place—home furniture by Anton’s sister, designer Tina Periquet, who also drew up all the lighting and interior details, and Osmundo Esguerra’s set of butaca chairs and beautiful cabinet made from narra burl and kamagong frames. 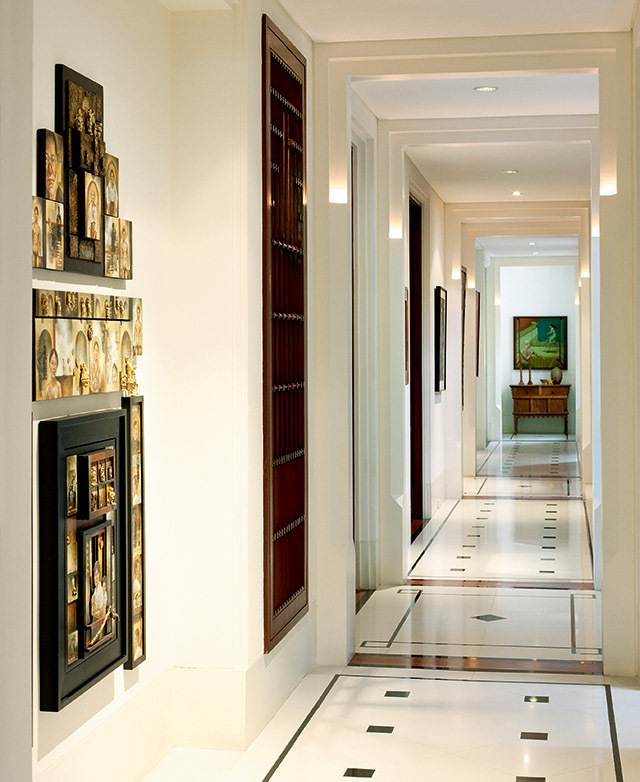 The main corridor, adorned with pieces from Lisa’s art collection including an interactive painted piece by Noel Cuizon in the foreground, runs nearly the entire length of the house. Sure to stir one’s sensibilities is the Solomon Saprid sculpture that functions as a center table—an Amihan figure playing the lute as she floats atop rice stalks. The ceiling is a sheet of glass. Above the floor-to-ceiling windows are green and lemon attic windows made by Filipino stained-glass maker Kraut. Their guitar motifs reflect Anton’s passion for music. 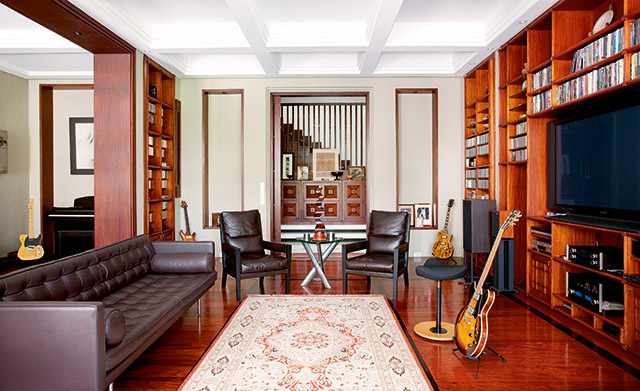 This passion becomes more evident in the spacious music room next door which doubles as his home office. There, one wall is dominated by an entertainment system and numerous shelves stacked with CDs and DVDs. A few of Anton's vintage guitars are lovingly displayed in the family's music room. In the dining room is another piece by Esguerra, a long narra dining table for ten. Prominently hanging above it is a two-tiered Fortuny silk lamp. The walls are filled with artworks by Filipino artists—a still life by Ofelia Gelvezon-Tequi, Allain Hablo’s copper-toned quilt made from encyclopedia covers, and an Anton del Castillo gold-flaked retablo. The kitchen behind the dining area could have easily been taken from a Latin American novel about food. The atmosphere was hectic, with the cooks swarming at the center island, their feet clattering on the Malaga tiles. The neutral tones of the glass pavilion are in harmony with the vivid colors of the garden. All these rooms face the wide-open garden. Near the property’s southern perimeter is a rectangular twenty-five-meter lap pool. At its end is a glass pavilion which is connected to the house by a covered walkway. Anton plays his guitar in the small studio he keeps underneath while his children play video games with their friends on the ground floor. 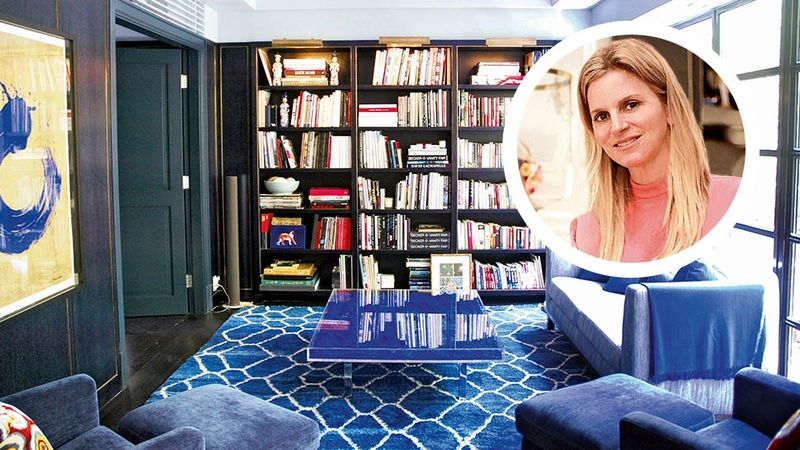 Lisa’s favorite room is the private library she asked to be built on the second floor, right over the foyer. It was inspired by the library at the Goldenberg House near Malacañang. On one end is Lisa’s great-grandfather’s massive wooden desk that has become her office. Left: A small cabana at the end of the pool gives the impression that one is at a tropical resort. Right: Wrought iron grillwork from Casa Vallejo—the Ongpin family's pre-war hotel in Baguio—is reused in the main doors to the living room. Lisa’s favorite room is the private library she asked to be built on the second floor, right over the foyer. 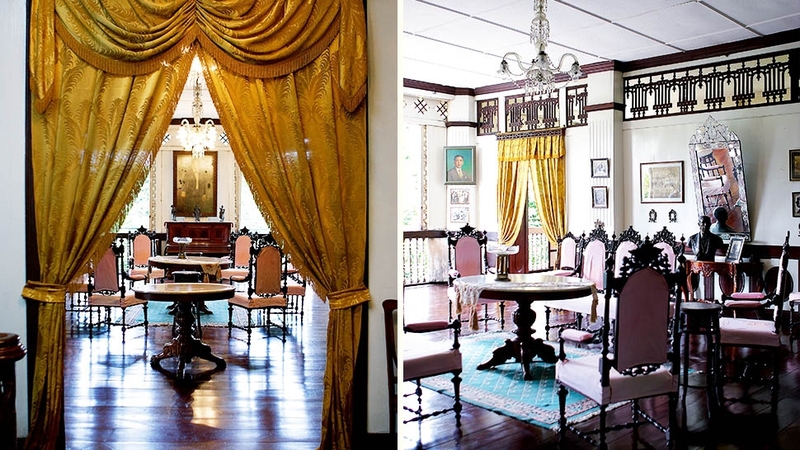 It was inspired by the library at the Goldenberg House near Malacañang. On one end is Lisa’s great-grandfather’s massive wooden desk that has become her office. Bookcases filled with volumes on culture, art and literature fill one wall; more artworks and collectibles occupy the rest of the walls. In the middle of the room is a long table filled with a scattering of magazines, piles of paper, more books—indications of a room in full use. 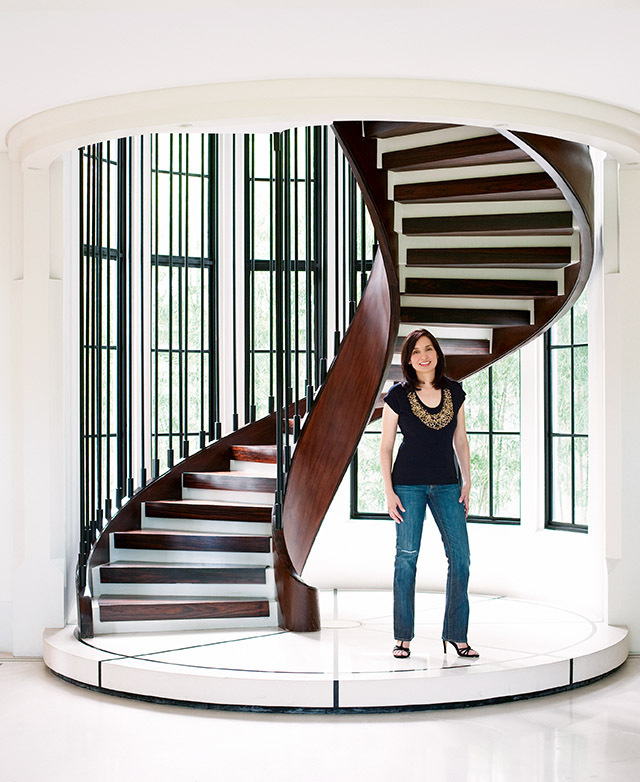 An Art Deco spiral staircase leads to a mezzanine high above, where Lisa stores her collection of children’s literature. From an attic window there, you can see the expanse of the living area. 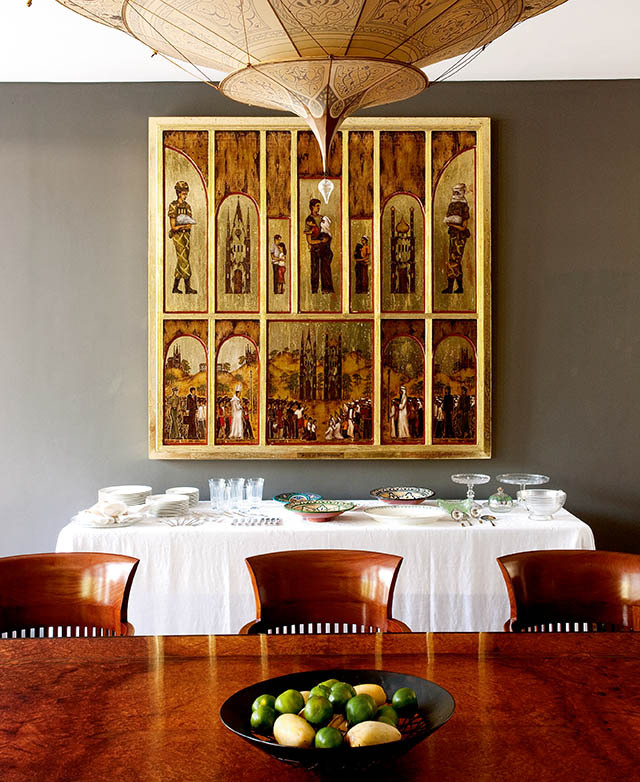 A Fortuny lamp and Anton del Castillo retablo compete for your attention in the dining room. The table is by Osmundo Esguerra. If Lisa is not in the library, she is in a small alcove downstairs that has been transformed into a command center. 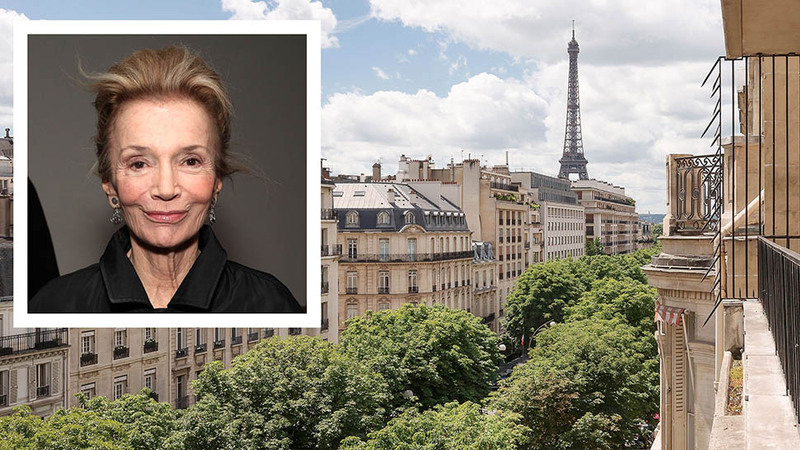 It is where she reads the papers, attends to tasks for the day or makes quick calls. And with the corridor behind her, she easily hears the comings and goings in the rest of the house. But such is the Periquet home. It is full of tiny surprises—from Tina Periquet’s lighting to Noel Cuizon’s interactive painting to Jorge Yulo’s chic Carlo Scarpa-inspired mini bar. The house is a play on the idea of anticipation. It seems to like its visitors to always look forward to something. Maybe that is the greatest lesson of this house. Today the virtue of waiting has been trampled on by our obsession to get everything done and received quickly. Tomorrow’s news has been taken over by social-networking sites. Digital cameras have replaced the one-hour photo service. Prefab homes are now a phone call away. As immediate gratification becomes the order of the day, no room is left for excitement. Thrill is thrown out the window. And yet the bigger things in life, like a house, are best achieved with passionate patience. Just as the pages of a great book need to gestate before they can take form and become ready and full, the home that any family dreams of calling its own takes time. The finest things always do. 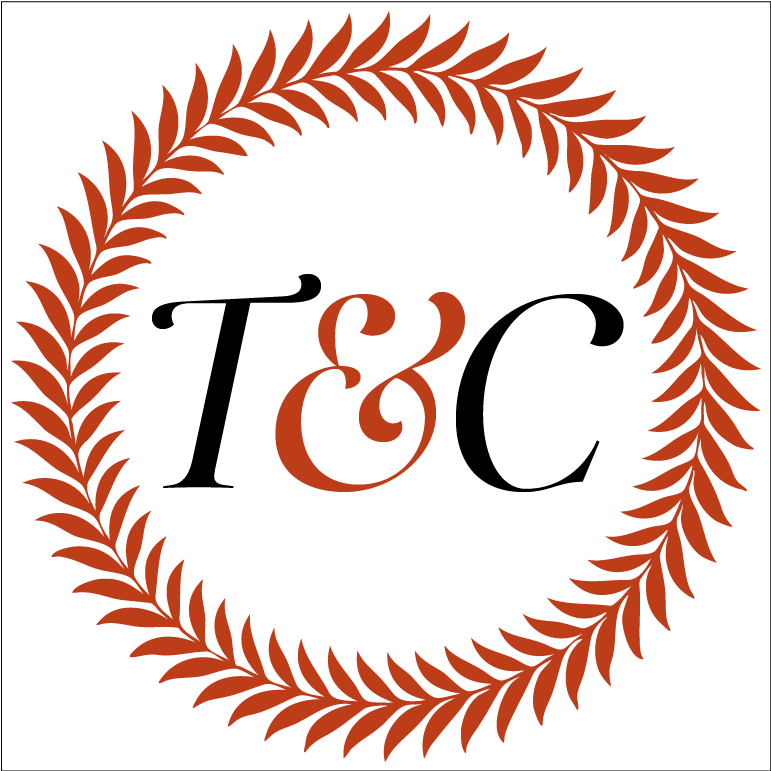 This story was originally published in the January/February 2010 issue of Town&Country.